The designer focused on the interactive wide touchscreen and the dashboard more than the actual chassis. The steering wheel included here is detachable and it can dock into the dashboard, in order to enter a “driving mode”. Users can unplug the wheel and enter the auto pilot mode. As a bonus, the big touchscreen can be used to watch a movie in “cinemascope style”. The steering wheel can be used as a remote for the dashboard and content playback on it. And that’s not even the end of it. 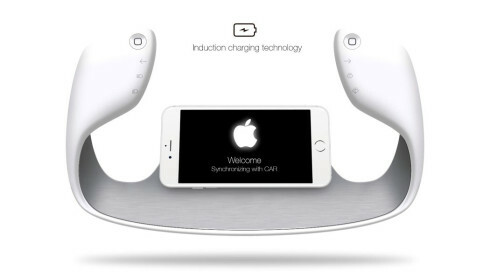 Apparently, one can dock the iPhone into the steering wheel for an easier access. If you ask me, that dashboard is a huge distraction from driving, but the future is all about self driving, anyway.